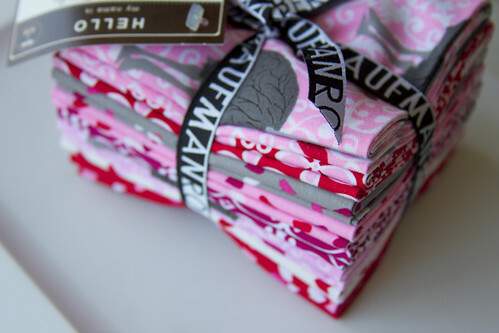 I was lucky enough to get a Fat Quarter bundle of Laurie Wishburn upcoming line Olive the Ostrich. I thought it screamed placemats for the girls. We use placemats for every meal and the girls love them. I think Gwen has claimed this one. She was very excited when I finished making them today. I used Kona Coal along with the fabric from the line on this placemat. Aren't the Ostriches cute? The girls love them. This placemat was alittle busy since I used the print as sashing so I used Kona pink as binding and it matches one of the hearts perfectly. Pretty soon these placemats will be washed a million times I know it. Now for the giveaway. Robert Kauffman & Laurie Wisbrun has sent along an extra FQ bundle so that you can play with these fun fabrics yourself. Just leave a comment and you will be entered. I will leave the giveaway open for a week until Tuesday August 28th. Goodluck! i hesitate to comment so soon... low numbers never win. but what cute fabric!!! This fabric is so cute, thanks for the chance to win. Definitley could use some placemats. What fabulous fabric! I love everything by Laurie Wisburn! They turned out so cute! My niece would love this fabric! Totally love those ostriches! Going to have to put them on my wish list for upcoming lines! And I love how you used them in the center of the stars. This is such unique fabric! Who would think of ostriches! ell, after llamas, I suppose ostriches! LOL! Thanks for the giveaway! Those are simply adorable fabrics and I love the placemats you made with them. The placemats are so cute. The fabric is adorable! Love this fabric! I have 3 grand daughters who would adore the ostriches. I'd love to work those into a quilt. How cute is this fabric??!! Love the ostriches! I need to make placemats. these are adorable. I love the prints that Laurie Wisbrun comes up with!! Your fussy cutting is adorable, I love how they're featured there. I absolutely swoon for Laurie Wisbrun! Thanks for this awesome giveaway chance... those ostrichs are too cute!! Those placemats are so adorable! I need to make a bunch for my table now! Love this line! Thanks for the chance. Those are some really cute placemats!!!!! Thanks for the chance to win! the placemats are gorgeous! Thanks for a chance win such beautiful fabric! So cute, Darci. We use placemats for every meal too...I should make some more. Thanks for the chance to win. I love the idea that your kids are happy with handmade placemats instead of having to have CARS or DISNEY PRINCESS ! love the placemats- what a great use for this fabric! This is the first time I've seen this fabric - it's SO cute. Love the placemats! Cute. I love Laurie Wisbrun's fun fabrics! love your placemats! i can think of a friend who these fabrics would be perfect for! how cute! I'd love to get my hands on some of this! Adorable placemats. Love the fabric! I love these fabrics! Thanks for the chance to win! I love Olive! Laurie Wisbrun is an amazing designer and author...love ALL of her stuff. This fabric is so sweet! Can't wait for it to be available. These are such cute placemats!! My girls would love them too! Thnx for the give away...it will get my head out if the sand. 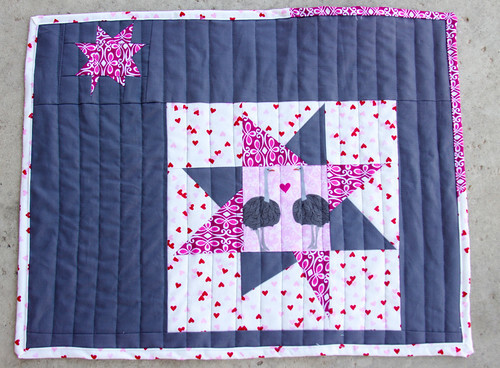 Love how you showcased that cute ostrich love in the center of your stars on the placemats. Very cute! Cute Cute fabric!! Thanks for the chance to win ~ fingers crossed! Girl, the placemats are adorable! 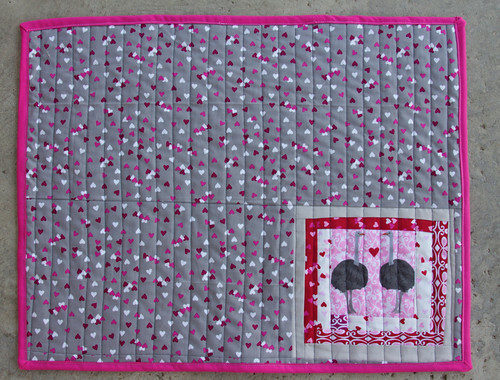 I love the way you've used this cute fabric, thanks for sharing! great placemats using great fabric! I haven't seen this line before! I love your placemats!! Thanks for the chance!! Oh my word this is so stinkin cute!! I love the ostrich and the hearts!! Ooh, this fabric is too cute. Thanks for the chance. cute project with cute fabric. L.O.V.E. Love this! Thanks for the chance! How adorable! Please pick me:). So cute, would love to win some of this to make something for my sister whom there is a running joke involving her and an ostrich! Very cute! Gotta love those ostriches! Love those placemats!! So does my daughter who is looking over my shoulder!! I just love Laurie's fabric! Such a great way to show off these cute fabrics! Very cute fabrics, would love to win them! I didn't even know I liked ostriches until I saw this! Ooh lovely work. And the ostriches are so original! I love Laurie Wisbrun! Thanks for a chance to win some of this line! Thanks for the giveaway! So cute!! Now this is one giveaway that I REALLY would love to win! Oh I love Laurie wisbrun!!! Thx for the chance!! Great fabric and cute placemats! I'm still too chicken to let my boys have fabric placemats. Maybe in a couple years. Those place mats are gorgeous. I know my daughter would love something made from these fabrics. And so would I! Thank you for a lovely giveaway. This fabric is so cute! I love the ostriches!! Thanks for the chance to win! I love those place mats, the fabric is fab! So cute! I've been meaning to make some for us for a long time. Also, the kids are coming home from school with "green ideas" about cloth napkins. Which is great. This fabric is super cute! Thank you for the chance to win! What a cute fabric collection! I love those placemats - super fun! Thanks for the giveaway. Love the placemats! Thanks for the giveaway! I love the ostriches and placemats are a great idea! Very cute. fun placemats! Thanks for the chance to win the fabric bundle. Great fabrics. My husband's niece would love something made from them. Thanks for the chance. Such cute fabric =) Hope I win! I LOVE Laurie Wisbrun's fabric lines! I currently own (hoard) some "Pickups and Pooches" and the Chairs line (can't remember the full name right now). Those ostriches are GREAT! Thanks for the chance to win. Who knew ostriches could be so adorable?? Thanks for the chance to win! I love these fabrics! I love your placemats & I'm not surprised your girls like them too - they're so pretty. I am a huge fan of Laurie Wisbrun, her fabrics are so gorgeous & the ostriches are so sweet! Thanks for the chance to win. Ostrich placemats would certainly make the dinner table more fun! And cute! I've been thinking I'd love to have these fabrics to make pillows for my niece to use on her bed, but she just might need her own special placemat too. Love these - super colour combos with the dark grey. I can imagine Christmas stockings for newly weds with the two ostriches looking at each other like that! Love these and have been drooling over Olive since I first glimpsed it a month (?) ago. Would love to make the stars you did in a big quilt. your placemats are awesome and that fabric is too cute! How cute is this fabric, and i love those placemats, when i finish some of my numerous wip's i have to make some! Thanks for the fantastic give away. I can see the fun fabric in a little girls quilt. So cute! I've been eyeing this fabric for a while now. Thanks for the giveaway! I love this fabric! What an awesome giveaway!! I love the ostriches! Thanks for the chance! Wonderful ostriches. thanks for the giveaway. Great placemat project! Thanks for sharing and for the chance to win. So cute!! Thanks for the chance! I am desperate to get my hands on this fabric so I can make a baby gift for a friend. waiting till November will be torture! 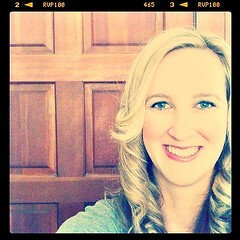 I have been loving your blog for a while, and not just because I happened to name my daughter Darcy! I love those ostrich fabrics! I have big plans on a cute dress for my little Darcy when I get some! Such adorable fabric, the placemats look wondeful! The placemats are fun and adorable, I love the fussy cutting. I would make some fabric baskets from the fabric. Thank you for the giveaway. the colors are great! Thanks for the chance to win. I'd love to play with these fabrics. Thanks for the giveaway. I've only just seen these fabrics for the first time tonight, but they are already on my 'need' list! So, so cute! Your placemats look gorgeous! Such a cute idea-love her fabrics! Your placemats are very pretty. Thank you for sharing and for the giveaway. Your placemats are so cute! Looks like a fun line! I honestly can't say I've ever found a FQ bundle that I've really liked, but this one might be the 1st! Your placemats are darling! I really, really love this line. Thanks so much for the chance! I love those placemats. My Ollie would get such a kick out of Olive. Thanks for this opportunity. I love Olive and hope that you pick ME! Your placemats are terrific! Your girls are so lucky that they have a Mom that sews for them. Love Laurie Wisburn fabrics and think these are so cute for little girls! I adore the placemats and the fabrics, they are adorable. So cute! I love the fabric! It would make some great skirts for my daughters! Love Laurie's designs. Thanks for the giveaway. your place mats are adorable and this fabric is so cute! Your placemats are awesome and the fabric is just so darn cute. I am going to have to search some out if I don't win. I would love to make placemats like that! Fun!! I never tought I love so much the ostrichs! I love the mstch between red hearts & green ostrich! thanks for the giveaway chance! I love everything Laurie creates! I'd love a chance to win. Your placemats are awesome. I love laurie's designs and especially "Olive". Here is to hoping! These are so cute! Going to have to try some for myself. I love the pinks and greys together. The Olive fabric is adorable! Very very sweet! I love the placemants and material! thanks! This fabric is made for little princess'. Thanks for the chance to win some. Super cute thanks for the chance to win! Love those cute little hearts! So very fun! Loving the sweet prints. Love the placemats! And the fabric is just so precious. Love the placemats and the fabric! Cute placemats--they would make setting the table fun. Thanks for the giveaway, and the project idea. some of those sweet ostriches ! the placemats are so cute in that fabric. So cute! Would love a chance to win this fabric. Thanks for the opportunity. Cute place mats! Thanks for the chance to win! that fabric is adorable...thanks SO much for the chance to win!! Your placemats are sooo sweet. I'd love the chance to play with these fabrics, too! Love the placemats! Such cute fabric. Thought that Brrrr was going to be my favorite new line, but Olive just took over top honors! I always kick myself when I don't pick up the pre-release lines from her. They're always so lovely. Darci just love the ostriches and the Kona grey matches perfectly. Love Lauri's work. Love this fabric and what Lauriie makes!!! Great giveaway! Thanks! I just love this line. Would love to make something special with it for my girlfriend in remembrance of her lovely Aunt. Thank you for the chance. Love your wonky stars! Your placemats show off this gorgeous fabric wonderfully. Thanks for the chance to win. So gorgeous - well done , my girls would love them! I love your placemats!!! Olive is too cute. Great detail on the back of the placemats. I love the placemats!! I just signed up to get notice of when this fabric is released! Hi. I am Darci and I love to sew. I have been sewing all my life thanks to my mom (she is the sewing master), but I would only sew in spurts depending on my mood. Since I have had kids I now sew all the time and it is my passion. Thanks for enjoying it with me. This is a Flickr badge showing public photos and videos from Darci - Stitches&Scissors. Make your own badge here.